Sports Essay: Will Women Play in the NBA? There’s no denying that sports have been evolving since they were first recognized as a recreational activity. Basketball has also changed after the realization that women have just as much talent and finesse as men. It was first made to believe that women had no talent and didn’t belong on the sidelines. Decades later times were changing again. Rumors, and headstrong analysts are speaking of the day when women and men will play together, in the setting of the NBA. The day is amongst us; it’s just a matter of time until we see the game play out. However, speculation of women playing in the NBA has been going on for years, or whenever there is a new set of sneakers that hit the courts. There have been many female athletes that have been comparable to men athletes in the past. In the early 1980s, Ann Meyers was one of them. Meyers grew up loving to compete and wanted to originally play in the USA Olympics (which she later did accomplish), she never looked at herself any differently as a female athlete. In a phone interview, Meyers discussed her life as a dedicated and determined basketball player. Meyers received a call from Sam Nassi, the owner of the NBA team the Indiana Pacers after returning home from the Sparikade Games in the Soviet Union in 1980. Nassi asked if she was interested in trying out with the team. After trying out, Meyers did not make the team, but drew a lot of attention to women as athletes. Title IX was still in its infancy and Billie Jean King had beaten Bobby Riggs in an exhibition tennis match less than a decade earlier. Meyers reflected on the opportunity it gave her. Meyers stands at a height of 5-feet-9, which for a female is tall, for a female athlete that is amazing. Former Baylor and WNBA sensation Brittney Griner stands at a height of 6-8, giving possible new hopes and analysis of a female entering the same court as a male. However, people don’t understand the reasons on why this is such a headstrong topic within sports, and people didn’t understand back when Meyers made headlines over her tryout. There was a lot of speculation that Meyers was part of a huge publicity stunt and that women would absolutely never end up playing in the NBA, or that Meyers would never be good enough to play at that level which gave her extra motivation to show her talent. Since this was the first time ever bringing up the question if women could play in the NBA, a lot of men and women didn’t understand why Meyers would even want to compete with men. The women’s league was already there to separate the two sexes for a reason. Jack McClosky, who was an assistant coach for the Pacers at that time believed in her true potential. In a phone interview Meyers gushed that Jack McClosky, who was the assistant coach for the Pacers thought she was just as capable as anyone else. “Annie is fundamentally better than half the guys out here,” McClosky said at the time. Although Meyers didn't make the Pacers, she signed a $50,000 guaranteed contract with the team. Meyers was the first and is still the only woman to ever have an official contract with the NBA. Ever since then every once in a while a woman will come along and challenge the question that has surrounded the league for decades: Can a woman really play for the NBA? If looking at the differences between the two leagues, there’s not that much that separates the game. The main differences would have to be the ball size, backcourt rule, salary and of course the popularity. The ball size in the NBA is around 29 to 30 inches, whereas women’s basketballs are 28 to 29 inches. The backcourt rule applies in the NBA when the ball has to cross half court in 10 seconds and a shot clock of 24 seconds. In the WNBA there is a 30-second shot clock. Salaries are something that sets the two leagues on extreme ends. While NBA players average around in the millions, WNBA players average around in the hundred thousands. Another major difference would be the popularity. Ever since the NBA was created, it gained the attention of millions of fans, endorsements and followers. In the 2012 season the WNBA hit a record low attendance of an average audience of 7,457. The changes that have happened throughout the progression of recreational sports has come a long way, men’s basketball and women’s basketball both started the same and took a while for audiences to build. The NBA for example wasn’t officially called the NBA in the beginning of its creation. The NBA consisted of a merger between the BAA; Basketball Association of America and the NBL; National Basketball League. It wasn’t until Aug. 3, 1949 that these two would form a league that would grab the attention of the fans, causing record-breaking ratings during the Playoffs. The first professional league dedicated to women’s athletics was called Women’s Professional Basketball League (WBL) in 1978 but was dismissed three years later in 1981. Fifteen years later, the WNBA was born. The WNBA was branched off of the NBA in 1996 and was the only league to be fully backed by the NBA. From that day on, women came out from hiding and showed their talents were just as good, if not exceeded men’s expectations. According to ESPN the number of high school girls who participated in sports was on the rise with 294,015 in 1971-72 to 3.1 million in 2010. In 2011, more than 3 million girls were competing. DePaul women’s basketball coach Doug Bruno remembers when he was a student playing at DePaul, and that women’s athletics were unheard of. After the Title IX became law, the first women’s basketball league formed, called the Women’s Professional Basketball League. Even though it only lasted a short three years, it showed young women, and their harshest critics; men that women posses the same amount of talent and capability to play basketball on a professional level. Years passed since the second forming of a women’s professional basketball league, known as the WNBA but it allowed several other women to be scouted and thrown into the idea of playing with men. The next biggest professional athlete on the female athletic side was Lisa Leslie. For three years in a row Leslie was named MVP and went on accomplishing several other awards, such as All-Star game MVP, Defensive Player of the Year and many others. This again led to a spread of analysis, interviews, and critiques if a female athlete could compete with men and be part of the NBA. Leslie retired in the 2009 season, but during an interview with Bare Knucks, an analyst from Bleacher Report, she said that she could have played in the NBA. This caused outrage, and a brutal article written why Leslie was wrong and women would never be able to compete at that physical level. However, men and women play together competitively all the time. In local gyms, pick up scrimmage games at the Parks; even High School and College teams hold practices against their men and women teams. The argument in the article, which has also been the strongest point in the twenty-year-old conversation made yet, is the physical elements between a male and female athlete. If a 6-5 woman is playing in the WBNA, that height would put her at either a center or a strong power forward, if not both. However, a 6-5 male would be considered a below average height and would be either placed as a shooting guard, or on the bench as second or third-string. According to DePaul’s athletic trainer Kristen Neisler, who has a degree in Physical Therapy, and Sports and Fitness management the day will never come because women and men are built too differently to ever compete with each other. There are some major differences other than our X or Y-chromosomes that separate us from being a male and a female. According to a New York Times article it isn’t about whether or not women can compete with men, but more to do with how we are individually built. Meaning the obvious, men have more levels of testosterone than women do which explains why they build muscle quicker and have more physical strength than females. If testosterone has been the answer from the beginning, why is it then whenever a young, talented, strong female athlete enters the age when it’s time to decide to go pro, these arguments suddenly emerge once again? The next new talent that appeared is Diana Taurasi. In 2004, Taurasi was wrapping up here college basketball career and looking forward to moving on into the WNBA. Being selected first overall in the 2004 WNBA Draft by the Phoenix Mercury she began her professional career. She was the new superstar of the court, someone new, raw, and right out of college. Years after time spent with the Mercury, the question was asked again: Can a woman play in the NBA? In an ESPN article from 2011, Taurasi was asked this several times. In the ESPN interview she told the reporter what everyone else has been saying for years. 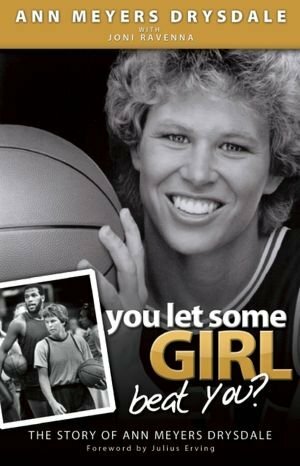 Now, after a few years have passed and the questions have died down yet again, another new female athlete has entered the game but this time has had some serious talks about playing in the NBA. Griner has both the WNBA and the NBA talking. After being named Female College Athlete of the Year, Griner reflects on the changes that she has faced while playing basketball and looking forward to her future in an interview with ESPN. “Just excited. I wouldn’t be here without Title IX, Everything is just coming together and it feels good to be here,” Griner said. 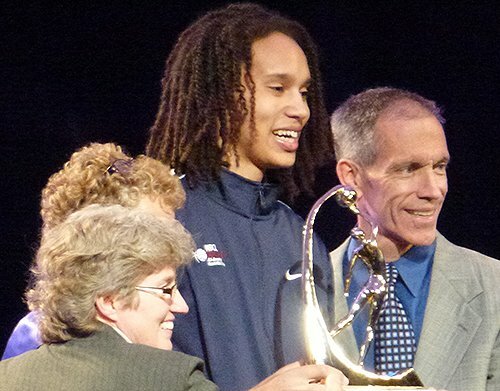 Griner has already accomplished many goals throughout her college career such as winning AP Player of the year two years in a row, named three-time All American, Most Outstanding Player of the Final Four, second all time scorer in the women’s NCAA history with 3,283 points, 748 blocks and a record of 18 dunks. This would no doubt lead her to be the WNBA overall first pick. The WNBA wasn’t the only league that was interested in Griner. As Griner’s Baylor career came to an end, rumors started surfacing in early April just before the WNBA and NBA drafts from Owner of the NBA Dallas Mavericks, Mark Cuban that he wanted to give Griner a shot in playing for his team. In an interview with ESPN, Cuban explained his reasoning’s why he wouldn’t mind drafting the first female player. Even though words were just briefly spoken, the media began evaluating Griner to see if she was capable. Standing at 6-foot-8 height and 208 pounds, Griner already has some advantages over the other females in the league. Critics began evaluating her genetics and discovered she has hands bigger than Miami Heat’s LeBron James, a shoe size of 17 and a wingspan larger than most NBA players. After the rumor going viral, Griner immediately responded on her Twitter and in follow up interviews that she would hold her own and would be more than ready to play with the NBA. Griner did get first pick in the draft and now will be playing along side with Taurasi, (the woman in 2004 who raised the question again if women could play in the NBA) with the WNBA Phoenix Mercury in the season to come. That doesn’t mean that tryouts aren’t in the 22-year-olds near future. Griner has already been spotted practicing with NBA legend Kareem Abdul-Jabbar in early May before the WNBA season begins May 26. There still may be some doubt though, that women will never make the day into the NBA. Even after over 20 years of the same questions, analysis every time a new female player comes into the spotlight some people think the day is amongst us, just not today. NBA commissioner David Stern told reporters that women would end up playing in the league and within the next decade. “I really do think it’s a good possibility,” Stern told Sports Illustrated. Bruno said that women and men are the same when it comes to talent, and knowing the sport but is unsure if there will ever be a day. Only time can tell until the day is amongst us when a woman will be playing among men in the NBA. There is no question that sports, specifically basketball has seen their fair share of strong, capable women athletes. Just like Meyers was given tryouts with the Pacers, the day will come again where women will tryout with more NBA teams. Griner is still young, and there are plenty of other female athletes to come. So the time is coming, just not today.